You may notice that I rarely write about concerts here. 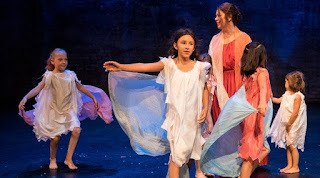 Plays are part of our regular life, and visual art, but not as much music. I was raised with very little music, in fact, which is why I've found it so important for Beatrix to have it (and a shout out to my aunt Jan, who started that early). Last night, as part of a team event for my incredible client Literacy Matters, we had a group dinner wand then went to see Carbon Leaf at the Fine Line. You may not know the name, but you know at least one of their songs "Life a life less ordinary, live a life extraordinary...."
Perhaps the BEST part though is that yesterday Patrick got the swingset set up for Beatrix. We've had it about a year, but had never had time for it before. Circus girl that she is, the trapeze is her favorite part and she has already spent quite a bit of time on it. I have spent the last three days doing historic survey in Ely. You might think about taking my Minnesota card away if I admit I had never been TO Ely before, only THROUGH it. But I think the town is used to that. For its entire life it has been the last stop, the jumping-off place for going into the wilderness, for paddling off into the Boundary Waters, the Quetico, or points farther north. But the last few days I've been studying the built environment — surveying the downtown, doing historic research, meeting with the HPC in City Hall. I've walked up and down the streets, had delicious coffee and muffins for breakfast, and ate at one of the best restaurants I've been to recently (hail Insula!). We stayed in a house in town across from the school that was like a trip back to 1972. 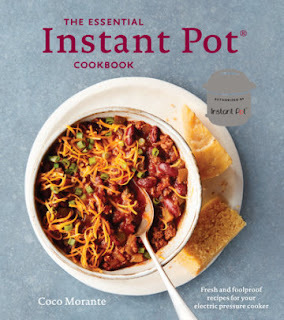 Anyone can tell you we love our Instant Pot. Even Patrick, who tends to not rave in these things, wrote a piece about it once here. So I had super-high hopes for this cookbook and some new recipes. If you have a brand new Instant Pot, it might be a good choice for you — some of the recipes are super simple, like hard-boiled eggs or rice (in fact, pretty much the same recipes that come with the Instant Pot) It also goes into a fair amount of detail on technique, such as quick-please versus natural pressure release. If, like us, however, you have conquered the basics and are looking for some new ideas, there's not a lot here. I got a few new ideas, but nothing that I felt like I needed to make right away. Most are riffs on things we are currently making, so I may try them to have a new approach. Eventual verdict — it's a fine book, especially for beginners, but not life-changing. I love gardening. I love being outside but getting something done, I love how it makes my home look, I love nurturing plants. I love trading plants with others, dividing my plants, cutting flowers and bringing them inside. But this summer, I gave up on it early on, consciously resisting putting anything yard-related on my to-do list. With 2+ places to keep up with (though the tenant at Winter Street generally does great with it), and with 2+ weeks in DC for circus in July plus 4 weeks of Patrick rigging here, it was just going to be too much. Something had to give, and so it was the yards. And it's been fine. People have enjoyed being here for pool parties and the like, and though it has not looked gorgeous, everyone has been too busy to complain. 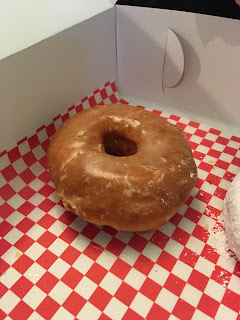 While the rest of the world is eating mini-donuts at the State Fair (ok, we did that too), I decided to do my own donut taste test challenge, by comparing some local donut shops. This actually all came about when Beatrix came to a client with me one day, so we decided to hit Bogart's on the way. We both decided that my glazed donut was the best choice, but did not take a picture, sadly enough. Next we tried Mojo Monkey, which I was rooting for because it was one of the original "craft donut" shops, and it's in Saint Paul so it's convenient. Usually it's crowded like crazy, but we slid in easily on a Saturday morning and used our Chinook Book coupon to get 3 free donuts. I have to say, though, my simple glazed did not hold up to Bogart's. It had a weird lemon taste to it — not bad, but weird, and was not as puffy and light as Bogart's.